St. Martin's Press, 9781250006813, 368pp. 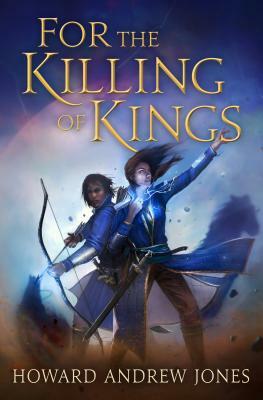 Howard Andrew Jones' powerful world-building brings this epic fantasy to life in For The Killing of Kings, the first book of his new adventure-filled trilogy. Their peace was a fragile thing, but it had endured for seven years, mostly because the people of Darassus and the king of the Naor hordes believed his doom was foretold upon the edge of the great sword hung in the hall of champions. Unruly Naor clans might raid across the border, but the king himself would never lead his people to war so long as the blade remained in the hands of his enemies. But when squire Elenai’s aging mentor uncovers evidence that the sword in their hall is a forgery she’s forced to flee Darassus for her life, her only ally the reckless, disillusioned Kyrkenall the archer. Framed for murder and treason, pursued by the greatest heroes of the realm, they race to recover the real sword, only to stumble into a conspiracy that leads all the way back to the Darassan queen and her secretive advisors. They must find a way to clear their names and set things right, all while dodging friends determined to kill them – and the Naor hordes, invading at last with a new and deadly weapon. When not helping run his small family farm or spending time with his amazing wife and children, HOWARD ANDREW JONES can be found hunched over his laptop or notebook, mumbling about flashing swords and doom-haunted towers. His novels include The Chronicles of Sword and Sand (The Desert of Souls, The Waters of Eternity, The Bones of the Old Ones) and several Pathfinders Tales. Jones has worked variously as a TV cameraman, a book editor, a recycling consultant, and a college writing instructor. He assembled and edited 8 collections of Harold Lamb's historicals for the University of Nebraska Press, and served as Managing Editor of Black Gate. He edits the sword-and-sorcery magazine Tales From the Magician’s Skull, and serves as Executive Editor of the Perilous Worlds book imprint.